As I mentioned in my previous post on finding a Real Rate of Return for My Lending Club Portfolio, I am unable to invest directly into the loans on Lending Club. There’s some regulatory issue between Lending Club and my state that makes it that way. So, I have to purchase my investments through their note trading system called foliofn. Not a huge deal, but it makes it a bit more interesting. First, I have to search for available investments. They’ve got a decent search, but it’s missing a few key things that really would make it top notch. Here’s what you’ve got as far as filters for the search, and, also how I usually set it up when I do a search. I don’t like seeing anything that’s been late, or is currently late. Late payments don’t show any intention of improving your situation, so I’m not going to take a risk on you if you don’t take it seriously enough to pay on time. You’ll notice that I also change the remaining payments to 56. The max is 60, but it’s hard to eliminate those who have been late if they haven’t had the chance to be late, so this makes it so that a few payments have to have been made. Of course, there are shorter term loans available in Lending Club, so you’ve got to keep an eye out for those. I don’t really limit the rates at all. I’ll explain why in a moment. Here’ s a sample of the results you’ll see when you do a search (click to see bigger). As you can see you get a really basic overview of the available loans. They’re all sortable. I usually sort by Asking Price because I usually have a set amount of available funds in my account and I want to purchase investments that will come as close as possible to exhausting those funds. There are three things that I pay very close attention to when I’m shopping for investments here. The first is the Credit Score Change. This is a visual indicator of whether the borrower’s credit score has gone down, up, or stayed the same since the loan was issued. I only buy loans where the credit score has gone up. It’s indicated by a green arrow that points up and to the right. Again, this is a personal preference, but I want borrowers who are want to improve their situation. It’s what this site is about, and something that I feel strongly about. I like to think of it as ethical investing. The second thing that I look closely at to compare the term of the loan with the remaining payments. This goes back to the late/never late thing. I’m able to eliminate loans that have been late through the search if the term of the loan is 60 months, but not if it’s anything shorter than that. I’m looking for loans that have made at least 2-3 payments. Finally, and most importantly, I look at the Yield to Maturity field. If I could change one thing about the search on foliofn, it would be to add a way to filter by this field. Here’s why. Because foliofn is a secondary market for these investments, you aren’t necessarily paying the price of the remaining principle. The seller is able to set his own price for the investment. So, the interest rate on the loan isn’t necessarily what you will earn on the loan. The Yield to Maturity field shows what the yield on the loan will be when it is paid off. This field will vary. That’s also why I don’t limit the interest rate in the search, although you could if you were looking for a certain credit level of loan to invest in. If you look at the example above again, you’ll see that the investments shown would be very, very bad choices. Where you draw the line for the yield will vary based on your personal preferences, but I usually won’t buy any of them unless they are at least 5%. My goal is to maintain a higher interest rate than any savings account, while maintaining a medium-high risk level. This means that my portfolio is weighted towards the C-D range loans. I still keep it diversified amongst the different rate levels, but it’s heavier in that area. You’ll notice that the results don’t show what range the loan is. For that reason, it’s handy to know, generally, what the interest rate ranges are for each of the loan credit ranges. Using the interest rate (not the yield to maturity) field, you can guess where the loan lies. So, all that goes into it. I look for an investment that has a upward trending credit score, that hasn’t been late and has made at least 2-3 payments, and that has a Yield to Maturity of greater than 5%. 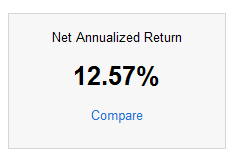 My portfolio is still rather small, so I try to keep individual investments to a $20-$40 range. I just don’t want to put too much of the portfolio in one loan and then get caught with my pants down if it defaults. As the portfolio grows, I’ll likely increase the upper end of this range. So far, I have had 4 of the investments paid off. Two of them have been paid off early. I have had no defaults. That’s a screen grab of my real return on the left. Adjusted for inflation, using the formula in my previous post, it’s still above 10%. Try and get that anywhere right now. My 401(k) is at -0.85% YTD, and my local bank pays 0.25% on savings accounts. Sure, it’s riskier, but I feel the increased return outweighs the increased risk, and I think it will keep it’s place as part of my investment strategy. I feel that I should make a disclaimer here. I’m not an investing professional. None of this should be taken as advice, but merely an amateur sharing information on my portfolio. See an investing professional if you’re looking for advice. Otherwise, feel free to share your stories in the comments! And, as always, if you liked the post, please take a moment to share it using the bar on the left hand side, or at the bottom of the post. Need an account? Sign up for Lending Club.